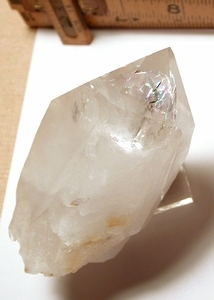 Deep veils cede half-way to clarity and rainbow foils at the point of this Arkansas rock crystal, 1-3/4x 2-1/4x 3-3/8" tall [cabinet sized]. Growth craters and marks shimmy up its' sides, pointing to a hairline 7h face, raised record keepers [four neglible fleabites] and those rainbows. May not care to leave your hand! Much more colorful in person.